While most wineries are only thinking about their next crop, Mount Pleasant is thinking long term, not only for the winery, but also for a environment. In 2009, the St. Louis Business Journal honored Mount Pleasant for its sustainable business practices when it was named a finalist for the publication’s Heroes of the Planet Awards. Mount Pleasant is leading the way for Missouri wineries in the practice of sustainable viticulture, an integrated system of wine grape growing that is economically viable, socially supportive, and ecologically sound. Mount Pleasant built their Branson location with a focus on sustainable practices. The 9,200-square-foot tasting and bottling experience runs entirely on hydro-electric power and the structure is built partially into the ground to reduce energy consumption. The winery is also “greening” the 150-year-old winery in Augusta. Both winery locations now use only energy-saving compact fluorescent bulbs. Recycling receptacles are also available at both winery locations, for everything from paper products to glass, and at the Augusta location alone over 100 tons of garbage per year has been eliminated from going to the landfill. In order to promote recycling, the winery has implemented a bottle return program at both locations. Guests can bring one empty wine bottle to either winery location and receive 10% off their take-home purchases. Mount Pleasant’s owner, winemaker and vineyard manager are all strongly committed to stewardship of the land, which involves maintaining and enhancing this vital resource base for the future. One of the first steps toward becoming sustainable is curbing herbicide and fungicide use, both of which can have a negative impact on the crops and pollute the water table. Mount Pleasant’s vineyard staff has also implemented IPM (Integrated Pest Management) programs to limit the need for pesticides. They incorporate calcium, carbon and compost amendments in their soils along with mechanical procedures to decrease insect damage and promote water-holding capacity in the soils. The winery trusts that these changes, along with many others to come in the future, will have a profound impact on their wines in coming years. 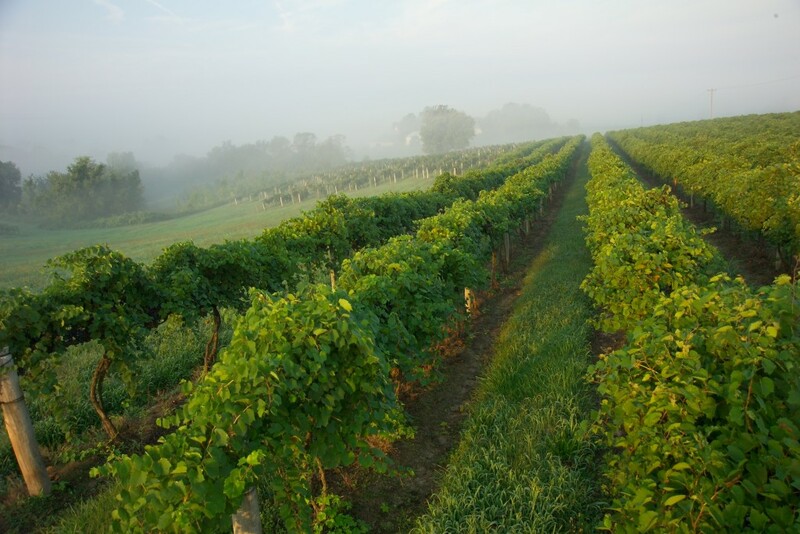 Mount Pleasant’s winemaking and vineyard staff have even used some creative methods to grow delicious grapes sustainably, including raising earth worms for castings which are incorporated into fertilizer for all of our plants. A knife insertion system has also been created to inject microorganisms straight into the ground due to their photo-sensitivity. Mount Pleasant realizes the importance of a healthy growing environment and aims to return the land to a condition as good as, if not better than, when they started. The winery replenishes and improves any nutrient or trace mineral condition that is depleted during the growing cycle.